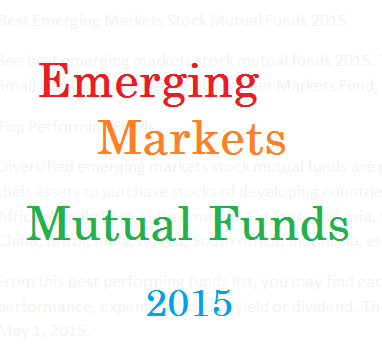 See best emerging markets stock mutual funds 2015. Top funds are William Blair Emerging Markets Small Cap Growth Fund, HSBC Frontier Markets Fund, etc. 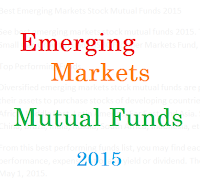 Diversified emerging markets stock mutual funds are part of international stock funds. These funds use their assets to purchase stocks of developing countries. These countries are located in Eastern Europe, Africa, Middle East, Latin America, Far East, and Asia. Some of popular emerging market countries are China, Brazil, India, Russia, South Africa, Indonesia, etc. From this best performing funds list, you may find each individual fund review. You can find the fund performance, expense ratio, and yield or dividend. The list is sorted based on its 3 years return up to May 1, 2015. This William Blair Emerging Markets Small Cap Growth Fund has a yield of 0.15%. The fund invests mainly in equity securities of emerging market small capitalization. Its expense fee is 1.65%. It has $314 million of assets. The portfolio turnover rate is 124%. The fund managers are Todd M. McClone and Jeffrey A. Urbina. Morningstar has ranked this top emerging markets stock mutual fund with 5 star rating. This equity fund has returned 18.23% over the past 1 year, and 16.03% over the past 3 year. There are 37 brokerages offered this fund. Top 5 stocks in its holdings are IndusInd Bank Ltd, Yes Bank Ltd, PT Matahari Department Store Tbk, Zhuzhou CSR Times Electric Co Ltd H Shares, and Bank Negara Indonesia (Persero) Tbk Class B. Top 3 sectors are consumer cyclical, financial services, and industrials. The HSBC Frontier Markets Fund utilizes its assets to purchase stocks of frontier market countries. The current yield is 0.70%. Morningstar has ranked this top performing fund with 5 star rating. Its expense fee is 2.20%. Driehaus Emerging Markets Small Cap Growth Fund is a no load fund. It has $638 million of assets. Its expense fee is 1.71%. The fund uses an investment style of mid growth. Top 2 sectors are consumer cyclical, and technology. The average 3 years return is 13.37%.